(Robert Vendettoli/Boulder City Review) Boulder City High School junior quarterback Makaela Perkins unwinds for a downfield pass Jan. 16 against Western in the Lady Eagles' 26-25 victory. Remaining in third place in the 3A Southern League, the Lady Eagles rallied past Western 26-25 on Jan. 16 and defeated Mojave 14-12 on Friday, Jan. 18. 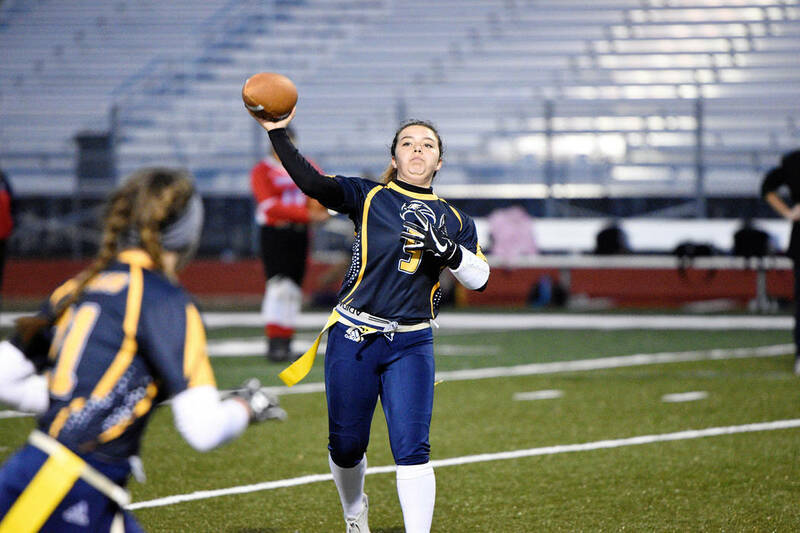 The Lady Eagles trailed the Warriors 25-7 entering the fourth quarter before the stellar play of junior quarterback Makaela Perkins led the comeback victory. Perkins connected on 23 of 36 passes for 206 yards and three touchdowns. Benefiting from her senior-laden receiving core, Perkins found Elizabeth Taggard (11 catches, 98 yards, two touchdowns) and Ryann Reese (six catches, 69 yards, one touchdown) consistently throughout the night. An all-around playmaker, Reese generated 47 rushing yards on 10 carries, while making seven tackles on defense. Junior Jasmyn Curl rushed for 108 yards and a touchdown on 15 carries to help the winning effort. Controlling their outing against Mojave from the beginning, Perkins continued to show consistency, completing 13 of 17 passes for 185 yards and a touchdown. Holding off a late Mojave surge, Curl rushed for 107 yards and a touchdown on 14 carrier, continuing to shine in her new role as lead running back to give the offense balance. Junior Clarissa Sitko led the defense, generating a combined 10 tackles against the Warriors and Rattlers. Riding a three-game winning streak, the Lady Eagles know there’s still room for improvement. With the second half of league games coming around, Boulder City will travel to Sunrise Mountain on Friday, Jan. 25 before hosting rival Moapa Valley on Tuesday, Jan. 29.